Mark Zuckerberg's Mobile World Congress appearance kicked off a debate among delegates about his company's mobile ad market dominance and the power of ad-blocking, Gideon Spanier writes. 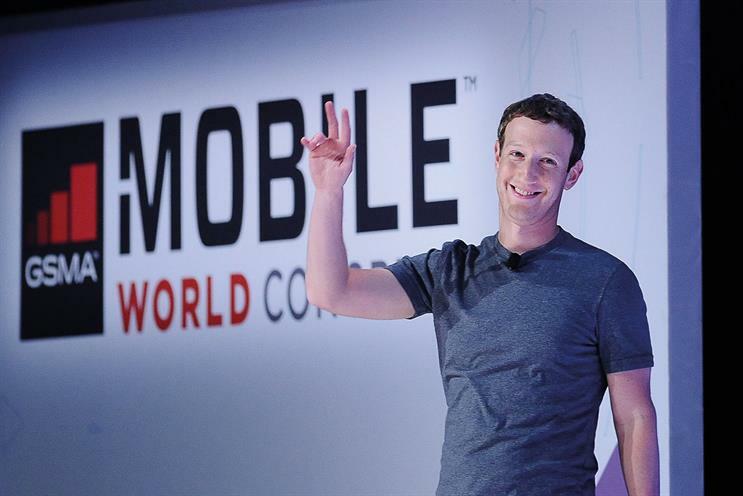 When Mark Zuckerberg appeared on stage as a surprise guest at the unveiling of Samsung’s latest Galaxy S7 phone and Gear VR headset at Mobile World Congress in Barcelona, the rock-star welcome he received from the audience of tech buffs spoke volumes. Zuckerberg’s Facebook is defining the mobile landscape like no other company because of its vast audience, its breadth of messaging services, its reams of first-party data and its founder’s vision through Internet.org of making the mobile internet available in the furthest corners of the world. The mobile phone networks and manufacturers, which spent tens of millions of pounds exhibiting their wares at the trade show, continue to look flat-footed compared with Zuckerberg, whose next obsession is 5G – the coming generation of ultra-powerful mobile networks. Vodafone’s chief executive, Vittorio Colao, made clear he is less than impressed when asked about Facebook’s desire to champion 5G when carriers are left to pick up the bill for the infrastructure. "We work with whoever," he said. The fact that Facebook dominated discussion, particularly among advertisers and agencies, also illustrated how most of the recent innovations in mobile have been in software, not hardware. The Internet of Things, mobile payments and virtual reality have been talked about for years – without reaching a tipping point yet. But mobile advertising has gone mainstream, with eMarketer forecasting global revenues will jump nearly 50 per cent to $100 billion this year and reach $200 billion by 2019, as programmatic buying becomes the norm. However, the great debate is about how to improve the mobile ad experience. "The current environment isn’t tenable. It’s got to evolve," Ronan Dunne, the chief executive of O2, said as he referred to "a lot of what can only be described as intrusive forms of advertising that are probably going beyond what customers reasonably want and expect". The mobile network Three, which is planning to buy O2, set the agenda ahead of MWC by announcing it would give users the ability to opt out of 90 per cent of ads – a potentially seismic move given that advertising underwrites the cost of so much content. Vodafone and O2 agreed with Three that something must be done – without going so far as to back ad-blocking technology. Colao said: "We are looking at this space. My principle is it should always be the customer’s choice, not the operator’s choice." Dunne does give his customers the choice to opt out of O2’s mobile marketing and of ads served by Weve, O2’s mobile ad-serving platform for brands, but he insisted blocking all ads across O2’s network was not "the answer". Instead, he urged advertisers to sign up to the Internet Advertising Bureau’s protocols on lean ads, which include a commitment to serve ads that are "appropriate to the device" and not to offer "pop-up" ones. "Good, well-considered advertising is akin to curation – it’s actually delivering value to customers," Dunne said. "When it’s unsought and it disrupts consumers’ ability to consume the content that they’re after, then it’s a problem. When more and more advertising is squeezed into that same square foot of content, that’s when the balance gets disrupted." Dunne said a question that mobile advertisers must address is: how much is enough? He said brands should follow the example of print in the past: "If newspapers wanted to put more advertising in, they created more content. The ratio of advertising to content was always broadly maintained." If the phone carriers are flexing their muscles by showing they can block ads, it is not only in response to unhappy customers but also to show that they aren’t a "dumb pipe" for the likes of Facebook. The phone networks own valuable first-party data that can targets ads effectively. Even so, Facebook’s 1.44 billion mobile users, plus those on Messenger, Instagram and WhatsApp, are larger than any carrier’s audience. Alex Newman, the EMEA head of mobile at OMD, described Facebook’s first-party data as "like gold" because it is "absolute" in terms of targeting consumers accurately about "things they are genuinely interested in". He warned: "The challenge for us is how can we be as accurate when we talk to everybody who is outside the Facebook ecosystem?" Daniel Rosen, the global advertising director at O2’s parent company, Telefónica, said: "We’re hearing a lot from the industry that there needs to be alternatives to Facebook." There is Google, but given that it and Facebook have more than 50 per cent of mobile ad revenues, advertisers would like more competition. Graham Moysey, the head of international at AOL, the ad-tech and content company that was bought by the US telecoms provider Verizon last year, hopes it can become the number-three player after striking a ten-year deal to handle Microsoft’s display ad inventory. "It’s a share game," Moysey said, referring to the demands of advertisers seeking global audiences. He argued ad-blocking will lead to a healthy "shake-out", explaining users can’t expect to "not have advertising" and "not pay" a charge or subscription for content: "What you will kill is the commoditised middle – non-relevant, non-timely, non-contextual advertising." Zukerberg didn’t talk about Facebook’s ad plans when he spoke at MWC but, whatever happens, expect him to keep leading the agenda.